For a motorcyclist winter time means mothballing your bike and doing some mechanical work. Since there was no major maintenance work to do on my bike I decided to upgrade it with some extras and individualize it. I’ll leave the photography topic of this blog for a second if you allow. Now back to this blog’s main topic – photography. After installing the last part I set off for a combined test ride and photo session. I packed my D750 with the 70-200 f2.8 VR lens and a mefoto tripod. I chose to drive to the Hanover fair grounds and the former place of the Expo 2000. Since I had no lighting equipment with me I had to rely on available light, provided by street lamps. When using available light some rules apply. First of all – you have to park the bike in such a way, that the part you want to show is not in the shadow (D’UH…). Experiment with the available angles you can position your bike in. 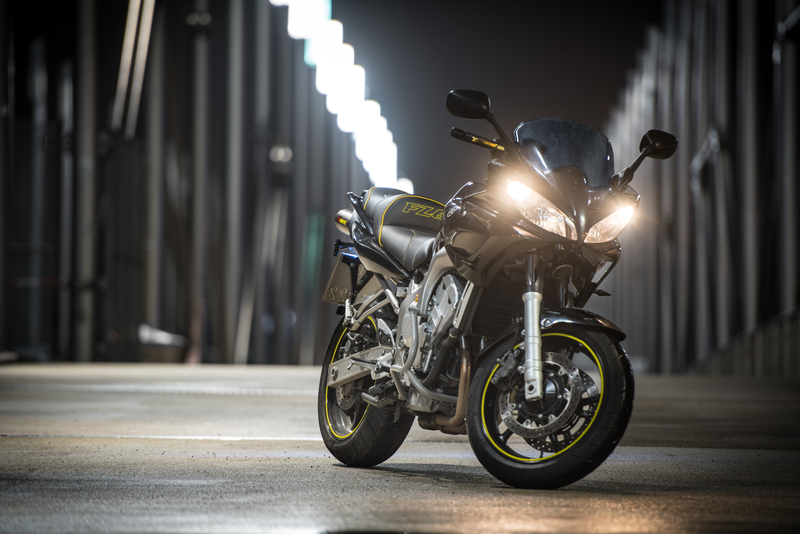 There are some factors you can alter: Location, bike on side stand / main stand, lights on/off, orientation of the front wheel, setting lighting accents with a flashgun (the latter which I did not do during this shoot). I shot in six different locations during that evening. In this post I do not show images from all locations, since some just didn’t work out. I must mention that four of the locations were within a radius of 150 m, so you don’t have to necessarily move far to get another background. It is in fact more effective to change the location or at least move the camera than making the tenth exposure from the same angle (that’s what I did in the past too often). The last location I chose was a short pedestrian underpass of a railway line. I shot in this location before, the inclined reader might remember the images from this post (scroll to the bottom). A quick and fun shoot, I relied on a proven recipe to make the images (street lamp light / positioning). But for this year I am planning to make some advances in my bike photography. First of all I want to portait the bikes with their riders. This I will do in a studio as well as a natural environment. The second step will be action photography, capturing bikes in movement. The third step, where I am still trying to get my head around the logistics, will be to shoot bikes from another vehicle, which is moving, too. So stay tuned for other exciting projects on this blog !